The Christmas season is my favorite time to wade through the Dollar Tree. Their selection of holiday decorations has come a long way over the years. Our Christmas tree is a rustic woodland theme (intertwined with kids’ fingerprint ornaments), and The Dollar Tree even has ornaments that go along with this decoration scheme. As a crafter, I also appreciate that The Dollar Tree has crafty items. On my last visit there, I spotted several craft items that I will have to go back and pick up for my kids for Christmas break. The Dollar Tree has been a long time spot to pick up inexpensive pieces for holiday crafts. 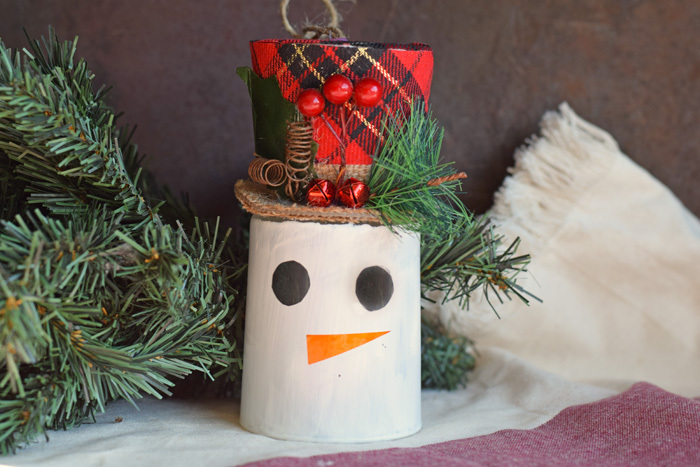 With a few dollars and a little creativity, it’s easy to create a fancy looking craft for any holiday season. 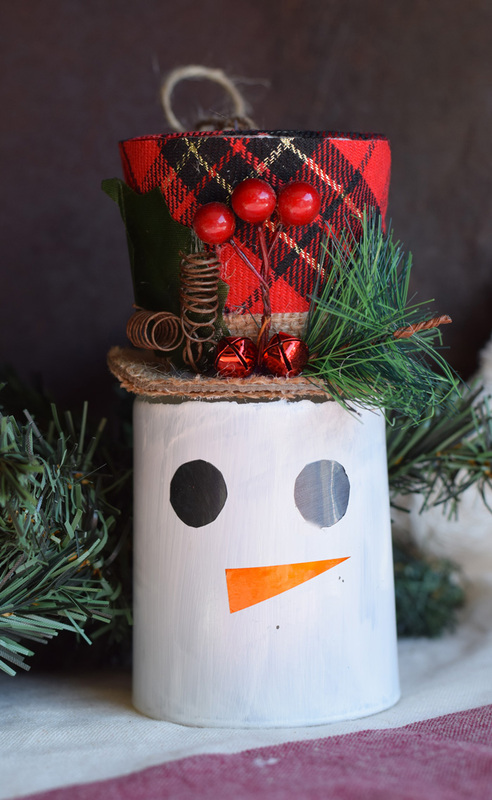 My kids like snowmen, and I created this DIY Dollar Store Christmas Snowman Craft for holiday decorations. Below I have included the supply list and steps. You will notice there are three different ways to create the eyes and nose. One way includes all items from the Dollar Tree. The other two methods involve using items that you may already have in your craft room if you are a consistent crafter. Read through the supplies and steps before purchasing your supplies from the Dollar Tree to determine with method is right for your budget and level of crafting. This post includes affiliate links which, when purchased through, add no extra cost to the consumer but provide this site with a small commission that helps bring more crafty tutorials! Paint the glass jar with the white paint. Let it dry in between coats. I painted 3 coats for maximum coverage. Allow the jar to dry completely. Flip the jar so that the closed flat portion (the bottom) is now the top. 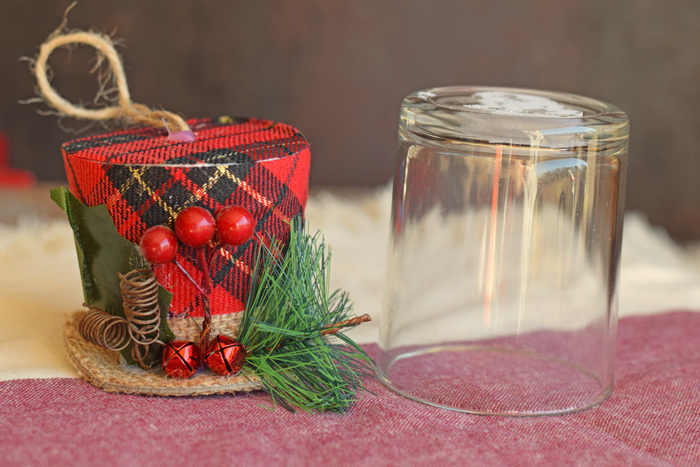 Use the hot glue to attach the top hat ornament to the closed flat portion of the jar. Use one of the following methods to create the eyes and nose on the snowman. (The Dollar Tree method) Use the black permanent marker and the orange permanent marker to draw the eyes and carrot shaped nose. (Inexpensive craft store item method) Use scissors and adhesive vinyl to cut black eyes and an orange carrot shaped nose. Peel the backing from the vinyl and adhere to the front of the snowman jar. (Specialty items needed method) Use a Cricut machine to cut two black circles and a triangle nose from the black and orange vinyl. You will also need a Standard Grip cutting mat for this method. Since it only involves cutting simple shapes, this is a great craft project for beginners using their Cricut machine. If you enjoy crafting with supplies from the Dollar Tree, check out a few of these tutorials below for more Dollar Tree tutorial fun! 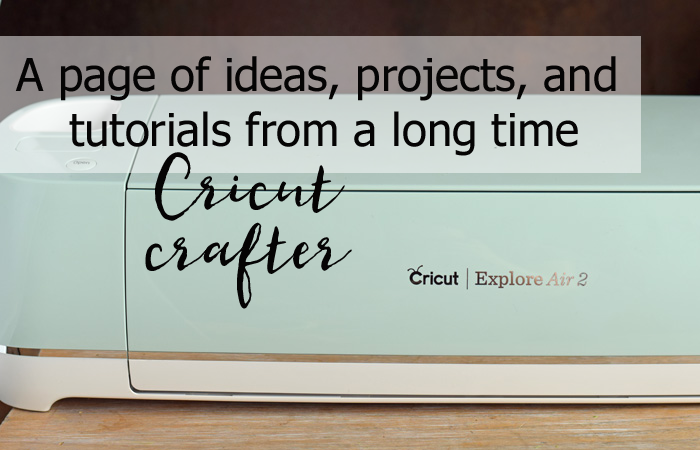 For more Cricut related tutorials and ideas, see my Cricut Project Page below. USA Toyz Snap N’ Glow in the Dark Race Track Gift Idea & Giveaway! Haha! Thanks, Karen! I’m not sure why!! 🙂 You’re amazing, too! I love to craft with dollar store items! I just picked up some ornaments to use on a wreath! Your snowman is really cute! Thank you! Can’t wait to see your craft!